We are absolutely thrilled that Emma Stokes has agreed to host our first physiotalk journal club on Monday 30th June 8-9pm (BST) when we’ll be discussing research carried out by her and colleagues into family mediated exercises after stroke. Emma is physiotherapist & associate professor at Trinity College Dublin and Vice President for the World Confederation for Physical Therapy. Emma will be hosting a journal club on research into family mediated exercise for people who have had a stroke, and in the pre-chat information below gives an introduction to this research and provides hyperlinks to the published papers. The paper for discussion at @physiotalk tweetchat on Monday 3oth June 8-9pm(BST) is Galvin R, Cusack T, O’Grady E, Murphy B, Stokes EK (2011) Family mediated exercise intervention (FAME): evaluation of a novel form of exercise delivery after stroke. Stroke 42:681-688. It forms part of a suite of papers that chart the journey of a research question from its inception to its final conclusion with the publication of the randomized controlled trial (RCT) above and its qualitative partner paper: Galvin R, Stokes EK, Cusack T (2014) Family mediated exercises (FAME): an exploration of participants involvement in a novel form of exercise delivery after stroke. 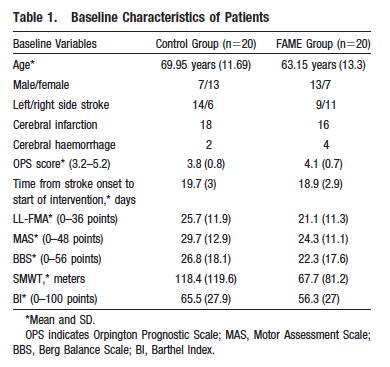 Topics in Stroke 21(1):63–74. Where did the question arise? The question arose from a clinical case combined with our previous research on how to use robotics to increase movement repetition during rehabilitation after stroke. The neuroscience literature suggested that the level of repetition during physiotherapy was insufficient to promote cortical reorganization hence, involvement of me and my PhD students in that field of research. However, at that time, it was clear that it was still going to be some time before the was both a clinical and cost case for introducing robots into physiotherapy rehabilitation and I had a patient who needed a lot of support for her exercise programme at home. So I asked her assistant to assist with the exercises for 30 minutes, 5 times a week and the results were fantastic. PICO The research question that arose and addressed in the RCT was: in people post stroke (P), does additional exercise delivered by a family member/friend (I) produce better outcomes (O) than tradition physiotherapy (C)? We introduced a mixed methods approach by nesting a qualitative study of semi-structured interview as well as the objective outcome measures in the RCT because we believed the approach would produce significantly richer data. 1. Galvin R, Murphy B, Cusack T, Stokes EK (2008) The Impact of Increased Duration of Exercise Therapy on Functional Recovery Following Stroke – What Is the Evidence? Topics in Stroke Rehabilitation 15(4):365-377. This paper yielded important data that informed the design of the RCT – firstly the additional time needed to be circa 1200 minutes, benefits were for lower limb & not upper limb, compliance was a big issue, people with moderate impairment benefited. 175 people with stroke, their family members and PTs were engaged (survey, semi-structured interviews, focus groups) to see how acceptable having a family member/friend delivering exercise would be & this informed the exercise programme as it was developed & delivered. 87% of people with stroke n d 91% of their family said ‘yes’. 622 potential participants were screened to achieve the 40 required for change in the primary outcome variable as per our power calculations. All those not included were accounted for and described. Intervention: family/friend delivered exercise programme, 30 minutes every day, reviewed weekly by the research PT, functional lower limb exercises to be done by the bed or at home, progressed as indicated, 8 weeks. An exercise log was completed at each session and reviewed by the research PT. More details on the methods of the RCT can be found here: Galvin R, Cusack T, Stokes (2008) A randomised controlled trial evaluating family mediated exercise (FAME) therapy following stroke BMC Neurology 8:22: 1-7. Compliance & participation: 3 participants were lost to the trial – all three became medically unwell. Intention to treat analysis was used to account for this attrition. Those who participated in the FAME group had a mean of 227 minutes per week which equates to approximately 30 minutes per day, 7 days per week. The research physiotherapist, Dr Rose Galvin, was available to meet the family members at times convenient to them. Table 2 below shows the changes in the intervention group and the control group from baseline to 8 weeks and from 8 weeks to 3 months. Carer strain was significantly lower in the FAME group versus the control group at 3 months. Quality of the RCT: this study aimed to minimize bias and has been reviewed on the PEDro database and has attained a score of 8/10 suggesting it is a high quality study. People are willing to deliver exercise to their family members with stroke and this has positive outcomes on impairment, activity and participation as well as on carer strain.